Down by the ferry at Woolwich a new tower is soon to rise, with work now underway after a change of owner. I covered proposals in 2014 for 152 homes opposite Waterfront leisure centre and the area formerly occupied by Greenwich council’s depot at Callis Yard. Inland Homes took forward proposals to planning, and after winning approval in 2014 sold it to Cordea Savills in May, who have now re-branded as Savills Investment Management. Their ‘Prime London residential property fund II’ entered into a joint venture with Urbanwise to purchase and develop the site. Demolition of the Callis Yard council depot has already commenced with completion planned for 2017/18. Photos of the demolition can be seen at Chris Mansfield’s excellent site here. Callis Yard was around for decades as a depot for cleaners and their equipment, located just off the main shopping streets. Is there still a cleaning depot in Woolwich or is it now all centralised in Thamesmead? Another local (and far smaller) depot that closed was in Abbey Wood, which is to become housing and which I recently argued should become another entrance to the forthcoming Crossrail station, cutting a fair time off passenger’s walk from the east. I do wonder though if these closures played a part in the large, on-going neglect of cleaning and public realm management in some areas? The tower joins an emerging cluster of tall buildings in the area. Preliminary work on Berkeley’s three riverside towers has been ongoing in recent months, and sales have begun of flats in this stage of the Arsenal masterplan. Slightly further west is the Mast Quay site. The first two stages went up around a decade ago but the tallest tower has stalled for many years. It includes a fourth, smaller building, slightly obscured in the render below. 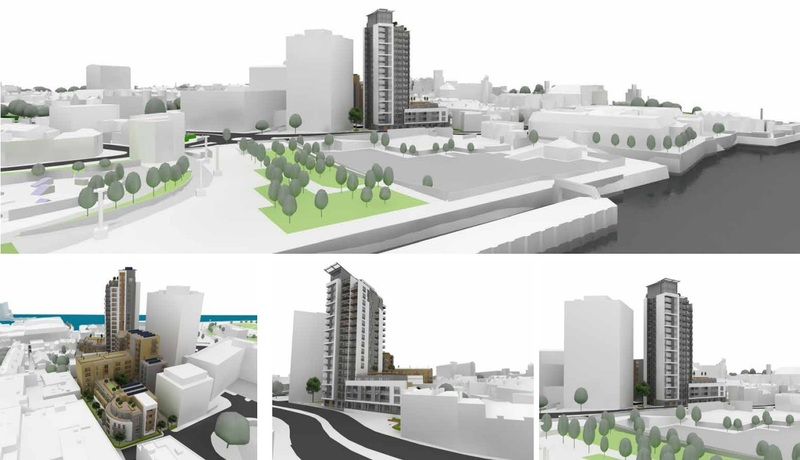 162 flats are planned here. There has been some recent some activity with further planning applications so this could be on the move. Waterfront leisure centre is sandwiched between this site and Berkeley’s Towers, and will be moving to Wilkinson’s site on General Gordon Square. The ferry is also expected to cease operations in the near future, with various contentious fixed crossings on the agenda. Though that’s been the case for many years, the ferry’s are increasingly unreliable. Work has been carried out but it’s common for only one boat to be operating due to mechanical faults. Once gone, the site will inevitably be sold for more towers. Any plans for Wilkinson’s to open elsewhere in Woolwich? One of the most useful shops we have. I hope Wilko finds a new home in Woolwich too. It’s a shame it didn’t end-up at the M&S building.